Learn today: 1) How a single post on Lifehacker turned into a US$3 million in glasses sales, 2) A list of 23 words that will get you more leads and sales, 3) One of the biggest SEO tools list available today, 4) How to get your AdWords advertisement showing up on the first page of search results, 5) Valuable business insights from an interview Hubspot had with Shopify’s CMO Craig Miller. 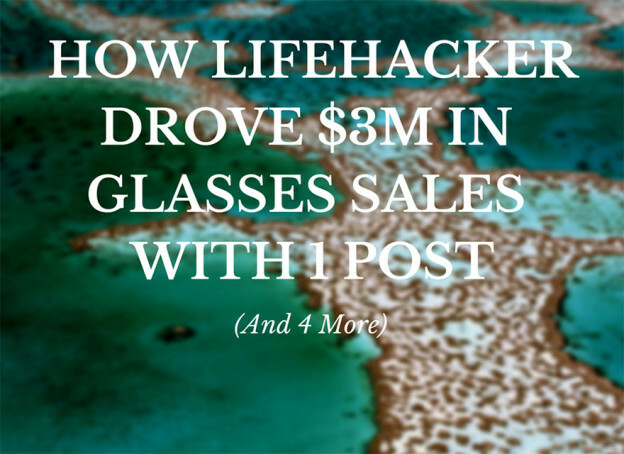 The 3 Million Dollar Post – How Lifehacker Drove 3 Million Dollars In Glasses Sales With 1 Post – This is the analysis of a piece of content that was published a while back on Lifehacker. The article was about online glasses stores. The post proved to be very successful in driving traffic to the brands featured in the article. Read above to have a general idea on how to estimate the revenue deriving from content marketing. 23 Data-Backed Words that Convert: Get More Leads & Sales with Attention-Grabbing Copy – Discover here the words that grab attention and help convert. As you navigate through this list, try to keep your business and respective goals in mind as this will help you extract more value. THE BIG LIST OF SEO TOOLS: 200+ – If your field is SEO, you’ll find this article useful. This is a massive list of over 200 of the best SEO tools, including links to the website, a short description, function, and whether or not it is free/paid. How To Get Your AdWords Ad Showing on the First Page – According to this article, “75% of internet users never scroll past the first page of search results.” Thus, it’s important for you to understand as much as possible about advertising with Google AdWords. This article has both basic and advanced strategies, for both the beginner and expert marketer. Shopify’s Growth & Marketing – How Shopify Grew 10x in 3 Years – You will find in this article a lot of valuable advice from an interview Shopify’s CMO Craig Miller had a while ago with Hubspot. This entry was posted in Customer Acquisition Strategies and tagged ads, advertisement, AdWords, free, leads, Lifehacker, sales, SEO, SEO tools on March 6, 2015 by Davide Di Prossimo.